The Friends of the Jones Library are sponsoring a new series of wildlife programs this spring, some for children, some for all ages. Help the birds construct their nests and nourish a variety of backyard songbirds and learn about larger animals. Each program will begin with a talk, followed by a workshop in which each person independently builds a feeder or nest helper that they will take home. Instructors will be available to help participants. All sessions will take place in the Large Meeting Room (downstairs) of the Jones Library. Pre-registration is required. There is a fee for materials for some Beastly Abodes & Caches programs due at registration. 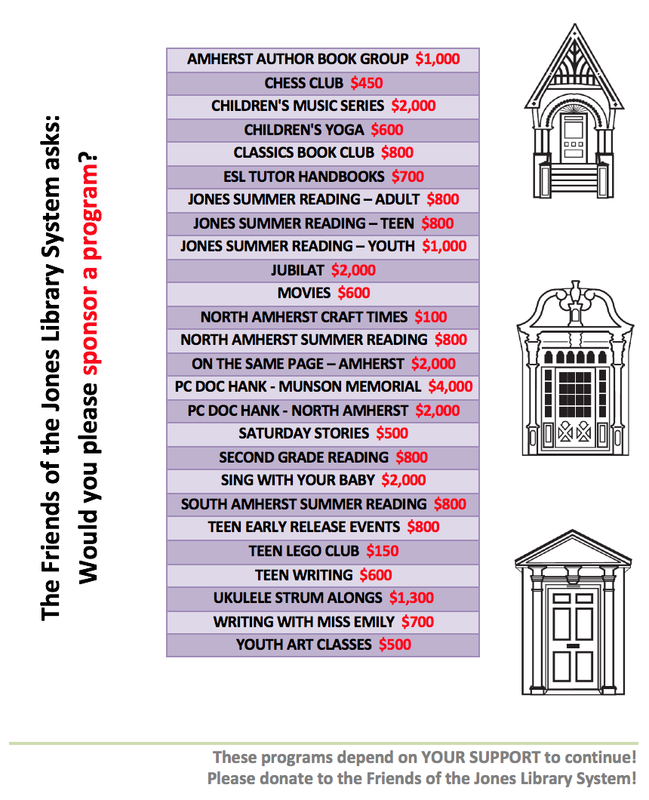 Scholarships are available; please see the Children’s Librarian. The Turkey and Coyote talks are FREE. Let’s Talk Turkey MARCH 21st FREE 3:00–5:00 PM All ages are welcome. (Lecture & Demonstration): Space is limited in the Large Meeting Room downstairs. Ron Gleason, of the Pioneer Valley National Turkey Federation will speak about turkeys that live in western Massachusetts and different species elsewhere. He along with Doug Little, Regional Biologist, will focus on conservation and habitat, learning about their vast territories, and how they live trap the birds in the wild for transport elsewhere. A demonstration of different turkey calls will be heard. This will be a ½ hour power point presentation. There will be a question and answer period following the lecture. We will help the birds build their nests. Birds use anything soft and naturally bendable to construct a bowl shaped nest for the eggs that are sure to come soon. This will be the home for young chicks for several months while they are growing. We will construct hanging balls with simple items from the around the house. Other ideas will be presented. Coyote Talk: APRIL 18th FREE 3:00–5:00 PM All ages are welcome. (Lecture & Demonstration) Space is limited in the Large Meeting Room downstairs. Laura Hajduk, Wildlife Biologist with MA Div of Fisheries & Wildlife, will talk about the Coyotes that live our area. Her talk will focus on rural to urban movements, conservation and habitat, learning about their vast territories. How to avoid conflicts with this curious animal with the homeowner and how this creature is misunderstood. This will be a power point presentation including photo on coyotes. There will be a question and answer period following the lecture. Learn how your backyard birds enjoy a splash and a drink of water plus nibble on seeds. A selection of seeds will be presented and which seeds are the best for which birds. We will construct stakes with a cup and a saucer that can be placed in the garden to nourish the birds in the summer months and show a little whimsy among the flowers.